Virtual Aituber Nana Debut – 00 | Mezashite! This happened all at once, but Aikatsu is on the Vtuber train now! I have no idea how regular or often or long these will be, but for now we’re on it! Collaboration between me and Maxine of Square Subs. Well, more Aikatsu is always good regardless of the form it might take. The quality is a little underwhelming for Aikatsu. I would have expected better than this from them. You can tell it’s animated and not mo-capped. That said, it’s pretty good, just less than I’ve come to expect from Aikatsu. 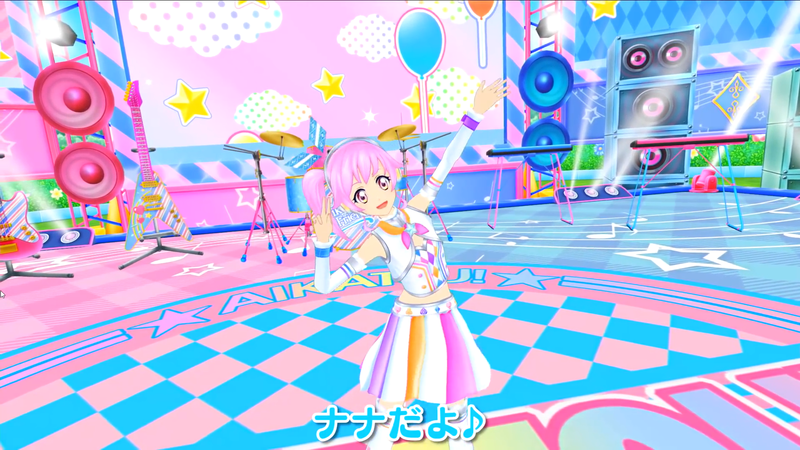 🙂 I know Aikatsu has mo-cap tech because they use it at their live events when they have the girls on the projection screen interacting with the audience, so I’m surprised they didn’t use it for this. I am impressed by your dedication! I appreciate it too, although I’m thinking it might be more for the Data Cardass players than the anime fans. I guess it’s too early to say either way! Considering that at a live event yesterday with Nana, how only the adults standing in the back of the room cheered for her, I’m thinking that it’s geared towards the Vtuber fan and Big Friend communities rather than the little girls. Let me guess who voices this cutie: Shimoji Shino.